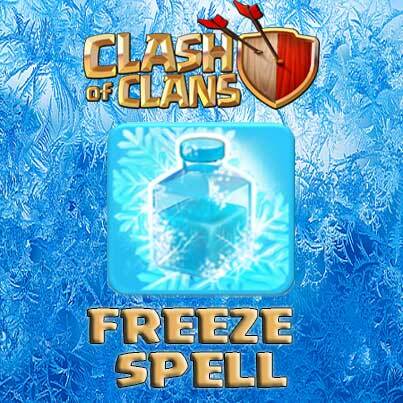 The Freeze Spell is one of many Spells in the Clash of Clans game. When the battle gets hot, stay frosty! The Freeze Spell sends out a cryogenic blast that temporarily immobilizes enemy troops and disables defensive buildings within its radius. The Freeze Spell is used to temporarily disable Defenses and/or ground and air Troops from the enemy Clan Castle within a small radius. Until the spell’s duration finishes, the affected enemy units will neither move nor attack. Enemy Troops that are not within its radius when the spell is cast are unaffected by the Freeze Spell, even if they move into the area of effect while it is still active. The Freeze Spell is currently the final spell unlocked in the Spell Factory. At its maximum level, it is the most expensive elixir Spell in the game. The Freeze Spell can freeze both ground and air troops as well as Regular and Dark Troops. It was added on 17 June 2013 as part of the “Freeze spell & Japanese” update. Cryogenic means relating to extremely cold temperatures. When used, the grass will turn light bluish (like ice), the defenses and other buildings will have a tint of light blue and the Walls will look as if they are made out of ice (the texture still remains the same). Among all Troops and Spells, The Freeze Spell is currently the only one that has 4 upgrades unlocked at the same Laboratory level (every other troop or spell has at most 2 upgrades unlocked at the same Laboratory level). 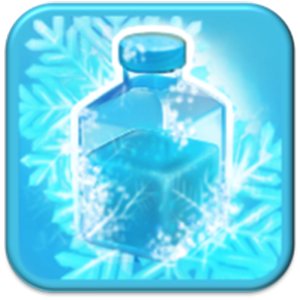 As part of the 10 December 2015 (Town Hall level 11) update the freeze spell level 1 has become available at Town Hall level 9.